When three deaf men in the 1960s invented and sold TTYs, the first teletypewriting devices that allowed deaf people to communicate by telephone, they started a telecommunications revolution for deaf people throughout America. A New Civil Right: Telecommunications Equality for Deaf and Hard of Hearing Americans chronicles the history of this movement, which lagged behind new technical developments decades after the advent of TTYs. In this highly original work, Author Karen Peltz Strauss reveals how the paternalism of the hearing-oriented telecommunications industries slowed support for technology for deaf users. Throughout this comprehensive account, she emphasizes the grassroots efforts behind all of the eventual successes. 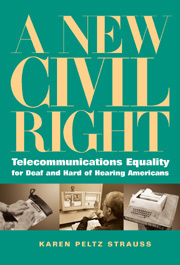 A New Civil Right recounts each advance in turn, such as the pursuit of special customer premises equipment (SCPE) from telephone companies; the Telecommunications Act of 1982 and the Telecommunications Accessibility Enhancement Act of 1988 and the 1990 Americans with Disabilities Act, which required nationwide relay telephone services for deaf and hard of hearing users. Strauss painstakingly details how all of these advances occurred incrementally, first on local and state levels, and later through federal law. It took exhaustive campaigning to establish 711 for nationwide relay dialing, while universal access to television captioning required diligent legal and legislative work to pass the Decoder Circuitry Act in 1990. The same persistence resulted in the enactment of the Telecommunications Act of 1996, which required all off-the-shelf communications equipment, including new wireless technology, to be readily accessible to deaf users. Karen Peltz Strauss is Deputy Bureau Chief at the Consumer and Governmental Affairs Bureau of the Federal Communications Commission in Washington, DC.